Aquatic and semi-aquatic turtles are popular as pets. The best-known species is probably the red-eared slider, but it's only one of several species of aquatic turtle that are commonly kept as pets. Many people do not realize how big aquatic turtles can get. 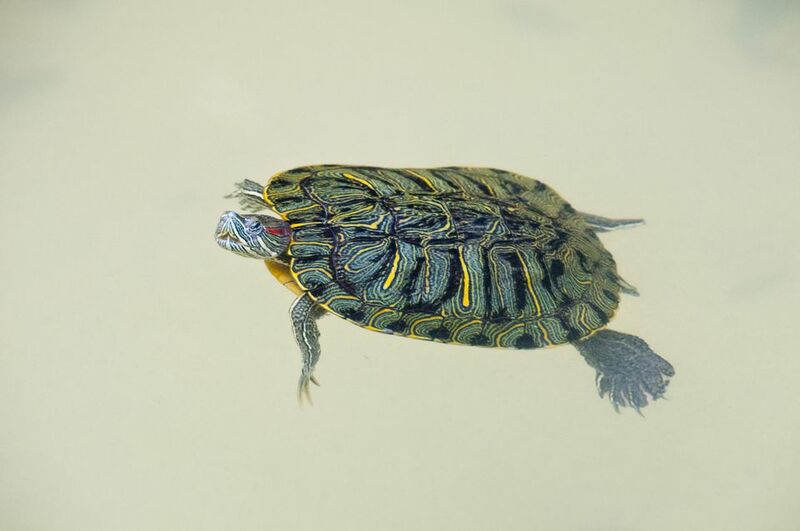 Red-eared sliders and a couple of other commonly available pet turtle species will grow to 10–12 inches long and therefore require correspondingly large enclosures. All turtles have the potential to enjoy a very long lifespan that can span several decades if cared for properly. Beyond providing a proper environment and diet for aquatic turtles, they do not need a lot of attention, although regular interaction may result in a tame and sociable turtle, especially with map turtles. In any case, they are lovely and if properly cared for, they should provide years of enjoyment. In the 1970s, the US government made the connection between turtles and Salmonella infections, especially in children, and banned the sale of turtles shorter than four inches long. The reasoning behind this ban was not that baby turtles carry more Salmonella than the larger ones but that children are more likely to handle smaller turtles or put them in their mouths. Aquatic turtles need large tanks, special lighting, good filtration, and regular cleaning. Aquatic turtles are not ideal pets for children. They are not easy to care for, not great as a pet to handle, and they often harbor Salmonella bacteria, which can be passed on to children who don't understand the need for good hygiene (such as hand washing). Younger children do not have the interest or ability to provide the amount of care and cleaning that an aquatic turtle requires, so parents must realize that the responsibility of caring for the pet ultimately falls on them when their kids lose interest. Aquatic turtles require fairly elaborate housing. They need regular exposure to ultraviolet (UV) light, so special light bulbs designed for reptiles that produce both UVA and UVB light should be in all turtle tanks. Without this light, they can suffer from metabolic bone disease (soft shell syndrome). Aquatic turtles are also messy, so their tanks need regular cleanings and, above all, a good filtration unit to help maintain appropriate water quality. They should have deep enough water to allow for swimming, along with a place to get out of the water to bask under a heat light. Appropriate water and ambient temperatures should be maintained at all times. Although aquatic turtle foods have changed for the better over the years, they are not recommended as the sole source of food. Most aquatic turtles are omnivores, although their preferences for certain foods might change over the course of their life, and offering a variety of foods is the best way to feed them. Leafy greens such as romaine lettuce, dandelion greens and parsley (fresh, not dried) are fine snacks for aquatic turtles. Since they're submerged in water most of the time, the best way to feed greens to your turtle is either placing the food directly in the water or using a suction cup clip to allow the food to stay in the tank but not float in the water. Chopped apples and frozen shrimp can be given to an aquatic turtle as an occasional treat, but are not ideal for everyday meals. Some varieties of aquatic turtles eat insects as well, but the main portion of their diets should come from plants. Turtles are messy eaters, so as a rule, feeding aquatic turtles in a separate container from their home tank will allow the mess associated with feeding to be contained. It also allows owners to monitor each turtle's food intake when multiple turtles live together. Given the right person and the right commitment, turtles make beautiful, fascinating, and enjoyable pets. The first steps to good aquatic turtle ownership are to research the species available and the care required of each species. While the basics of aquatic turtle care are similar for all species, potential owners need to review the specific details regarding housing and feeding for the particular species they want prior to purchase. For beginners, the hardier species of aquatic turtles are recommended, such as red-eared sliders, cooters, mud, and musk turtles. Keep in mind that sliders and cooters will reach a mature length of more than 12 inches, while mud and musk turtles are about half that size. Pet turtles have been popular for a long time. Baby red-eared sliders were readily available and inexpensive many years ago, which unfortunately resulted in a lot of neglected turtles. Roundworms and other internal parasites are frequently found in turtles and don't usually show obvious symptoms. An exam by a reptile veterinarian is usually when these are discovered. Vitamin A deficiency is also a common ailment among turtles. The symptoms may include abscesses in the ears which produce swelling behind the turtle's eye. Pus, which looks like cottage cheese, may appear. Respiratory infections, which are characterized by wheezing, nasal discharge, difficulty breathing and lethargy are also found in most reptiles, and turtles are no exception. Among aquatic turtles, shell rot is a common ailment. This usually occurs when the turtle has a bacterial or fungal infection, many of which can cause ulcers across the shell. This is particularly painful for the animal, as the shell protects its internal organs. These types of infections usually occur after a turtle has been injured or has been under a great amount of stress. All of these health issues should receive treatment from a veterinarian who specializes in reptiles, ideally one with expertise in turtles.